When it comes to reveal details on planetary disks, we mainly deal with image processing technics. But in this article I will describe how interesting can be another technic that it is the animation of still images to make planetary globles rotate. I have re-discovered this (by the way not new!) technic last summer and it has become for me essential on some planets! The purpose of image processing is to reveal details both by increasing their contrast, and lowering the noise on the surroundings. The better are those two parameters, the most of them become visible while being of very small scale and/or very low contrast. 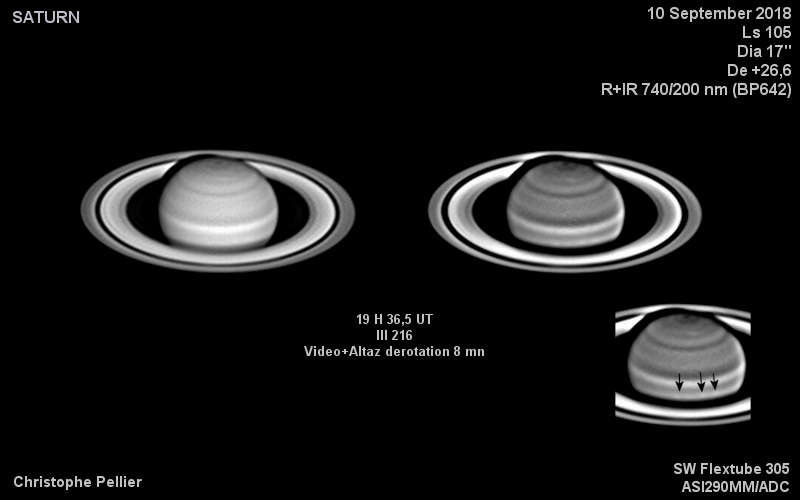 Saturn animation on August 14th, 2018 (taken at an elevation of 19° only). The rotation of the northern polar hexagon is visible. As well as some other things…. By showing that the details are present on two consecutive images (or more) it produces a proof that they are real, since one of the essential differences between true signal and noise/artefacts is that the seconds usually do not repeat from an image to another. By creating a movement, the animation helps the eye to catch such details. Our eye is indeed sensitive to the movement of objects in its field of view. We will soon find that the farthest gas giants will particularily benefit from that. Saturn, Uranus and Neptune present a storm or perturbations activity of very small angular size and of very low contrast most of the time, to the contrary of Jupiter whose details are in general much more easy. 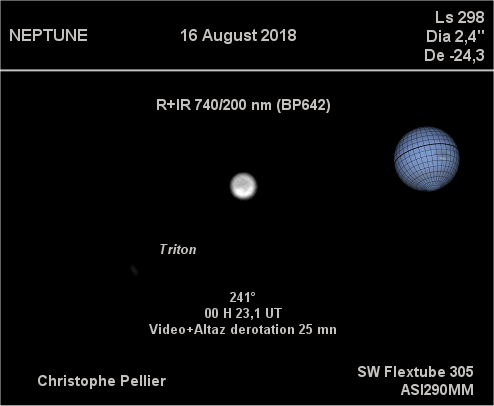 Very helpful for Saturn, it becomes from my point of view unavoidable for Uranus and Neptune, because despite the huge progress of amateur imaging in this area, the details remain at the limit of credibility. 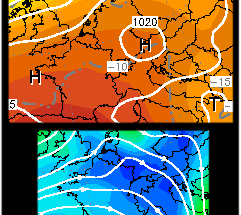 Even a short two-images animation will support the observations. 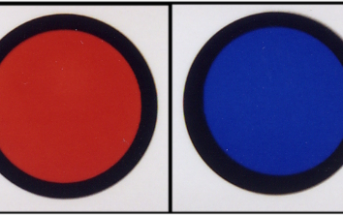 The three white patches are rotating. So they are real. None of the two still images taken separately would have been enough to conclude. 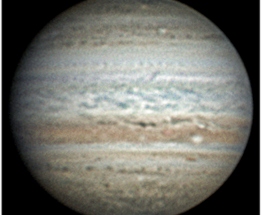 The weak natural contrast of far gas giants is not the only reason why detail detection is difficult on their disk. Poor seing of course plays a role as well! On these images from August 27th, seeing was bad and after processing the images I was about to throw them away. But just to be sure I made a quick animation between the two and then I was surprised to see a dark spot rotate near polar region (upper left)! And finally here is a regrettable case on Neptune. On last August 16th, seeing was very good but my plan was only to make a test of a particular filter. The result could show a bright spot quite well visible. Is it real? Unfortunately without a second image, and so with no animation possible, I can’t be sure. It’s very important to take care of the proper alignment of individual images. Any alignment error will disturbe the eye. It’s certainly better to only animate images taken on the same wavelengths range, i.e. the same filtering (for example two color images, or two infrared). It’s not forbidden to use different IR filters but the images will vary slightly in albedo, contrast or even details and so it could hinder interpretation. It’s very important for Saturn, a planet whose aspect varies quite a lot when the wavelength change, unlike Jupiter. It is helpful, though not essential, to try to keep a regular image spacing when planning to do an animation, like 5 to 10 mn for Saturn.